Rwandan troops have arrived in Sudan to help protect African Union (AU) ceasefire monitors in the war-ravaged western region of Darfur. "We welcome the 150 Rwandan soldiers," Sudanese Foreign Minister Mustafa Ismail told reporters. He said 150 Nigerian soldiers would join the protection force this month. The small AU team is overseeing a ceasefire between Khartoum and two rebel groups in Darfur, where fighting has claimed 50,000 lives. BBC correspondent Ishbel Matheson says there has been an upsurge of Sudanese refugees fleeing across the border into Chad on Sunday amid reports of renewed military activity in Sudan. The United Nations refugee agency UNHCR said about 500 people crossed the border close to the Chadian village of Berak and further north in Bahai. The refugees spoke of a second wave of violence, our correspondent says. The Rwandan contingent had landed in El Fasher, the capital of Northern Darfur state. The BBC's Barnaby Phillips in El Fasher says the soldiers were regarded with some suspicion by Sudanese government officials and soldiers as they filed off the aircraft. Tens of thousands of people flocked from the surrounding desert to watch their arrival. The UN has said the deployment of 2,500 AU peacekeepers is being considered but Sudan has voiced opposition to such a large force. Mr Ismail said it would be unacceptable for African Union troops to fight the Arab militiamen, the Janjaweed, who have been accused by aid workers and refugees of ethnic cleansing. "If those forces were to enter into clashes with the Janjaweed and armed militia, this would create an unfavourable climate," he said, the state-controlled Sudan Media Centre reports. In a radio address, Sudanese President, Omar al-Bashir blamed unnamed enemies for the crisis in Darfur and said his government was capable of restoring security in the region. More than a million people have been driven from their homes since the conflict started 18 months ago. On the edge of El Fasher a vast city of tents and makeshift huts is home to thousands of displaced people. 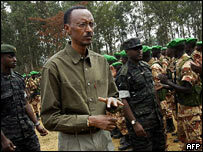 President Paul Kagame said the Rwandan troops would use force if necessary to protect Sudanese civilians, according to the Associated Press. "If it was established that the civilians are in danger then our forces will certainly intervene and use force to protect civilians. "In my view it does not make sense to give security to peace observers while the local population is left to die." 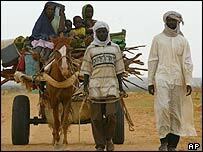 UN special envoy Jan Pronk has said he wanted many more African observers in Darfur. He said that progress had been made in talks with the Sudanese government about the establishment of 20km wide safe areas around giant refugee camps in Darfur. Under the proposal, which is expected to be finalised in the coming days, neither soldiers nor the pro-government Janjaweed militia would be able to carry weapons of any kind in these areas. Despite the progress in Khartoum, Mr Pronk acknowledged that fighting was continuing in Darfur, with Janjaweed fighters ignoring official instructions to end attacks. Peace talks due to take place in Abuja on 23 August between all parties in the conflict - the Sudanese government and the two rebel groups - will go ahead, Mr Pronk said, despite uncertainty about whether the rebel groups will attend. "The Sudanese government was reluctant to accept this protection force"